In order to give you a better idea as to which players are likely to receive FUT TOTW cards, we created this page where you will find FIFA 18 Team of the Week Predictions for each week. It is important to note that the TOTWs published on this page are not the final ones. They are suggestions based on the player’s performances and in our experience. The official TOTWs are announced every Wednesday and you can see them here. 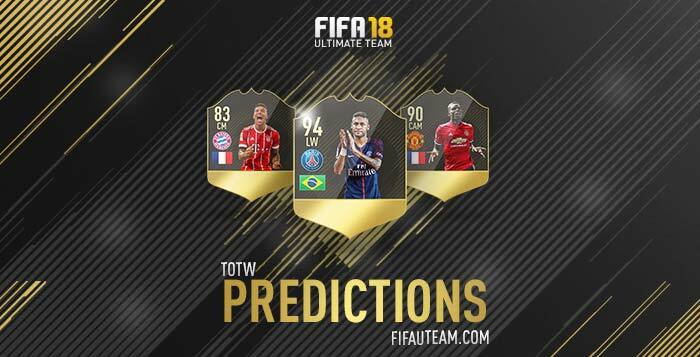 Don’t forget to come back every Monday to check our new FIFA 18 Team of the Week Predictions. Our FIFA 18 Team of the Week Predictions are updated every Monday.